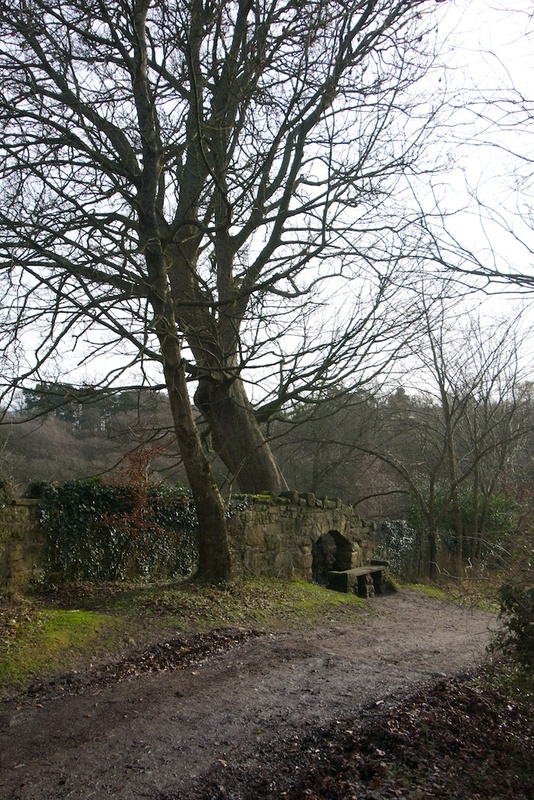 On dark and stormy nights, so it is said, a blood-curdling sound can be heard in the woodlands around Rosslyn Castle. According to folklore, it comes from a phantom dog, the ghost of a war hound which belonged to an English knight. 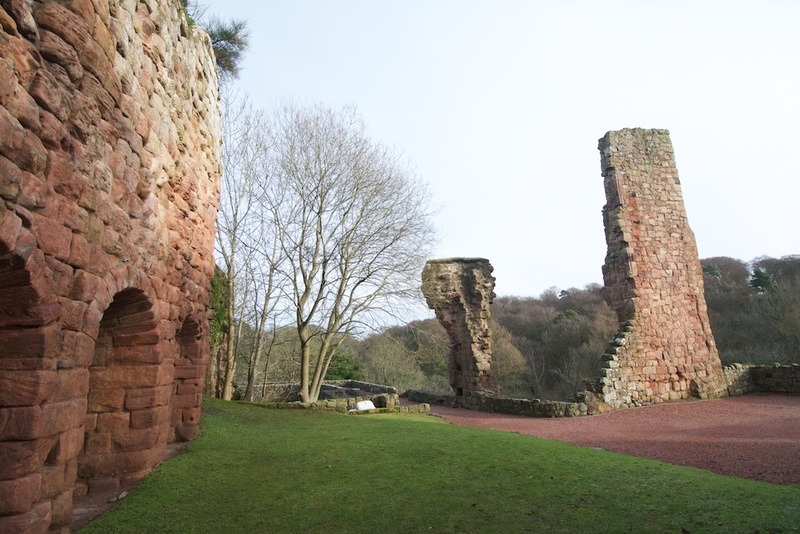 In 1302, there was a fierce battle in Rosslyn Glen between Scottish and English forces. 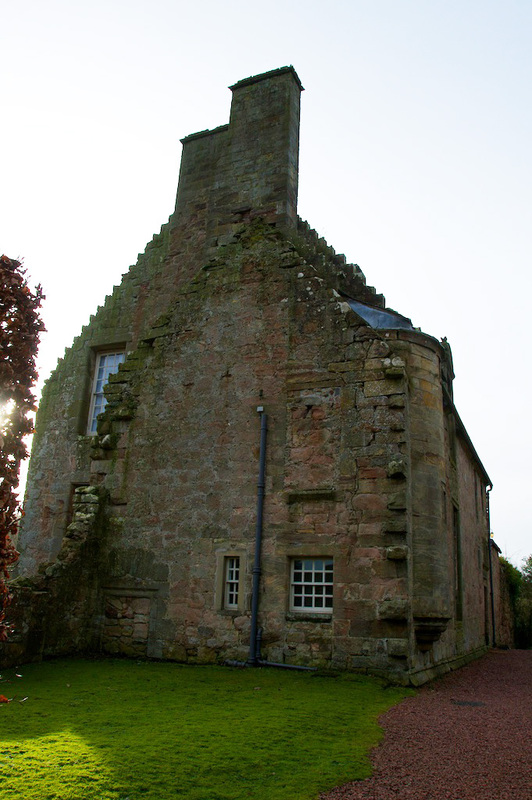 When a Scotsman killed the English knight, the dog set upon him and he was forced to slay that, too; but that wasn’t the end of the story, because every night from then onwards the ghost of the dog would appear in the guard room at Rosslyn Castle, terrifying the soldiers who were garrisoned there. One night, the man who had slain the dog was on watch duty: he let out a terrified scream when he saw the apparition, and died three days later. After that the ghostly visits ceased, but the dog’s baying could occasionally still be heard in the glen. 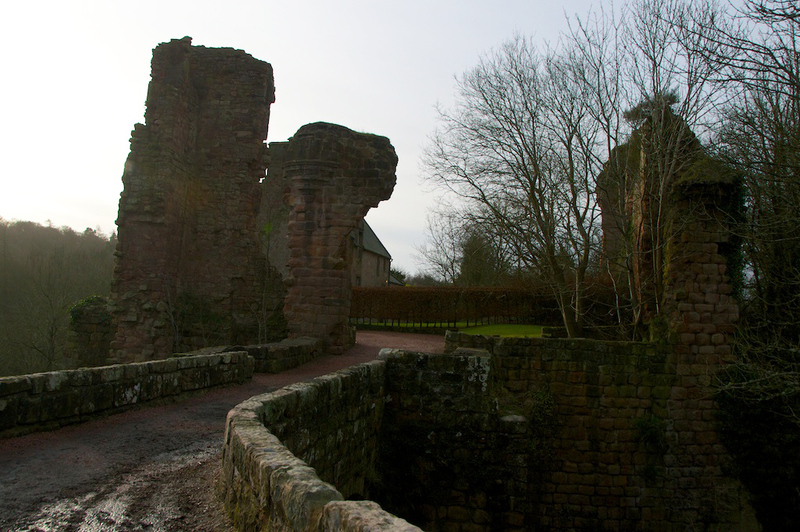 With so much attention focused on the beauty and history of Rosslyn Chapel, it’s easy to overlook the existence of Rosslyn Castle altogether. 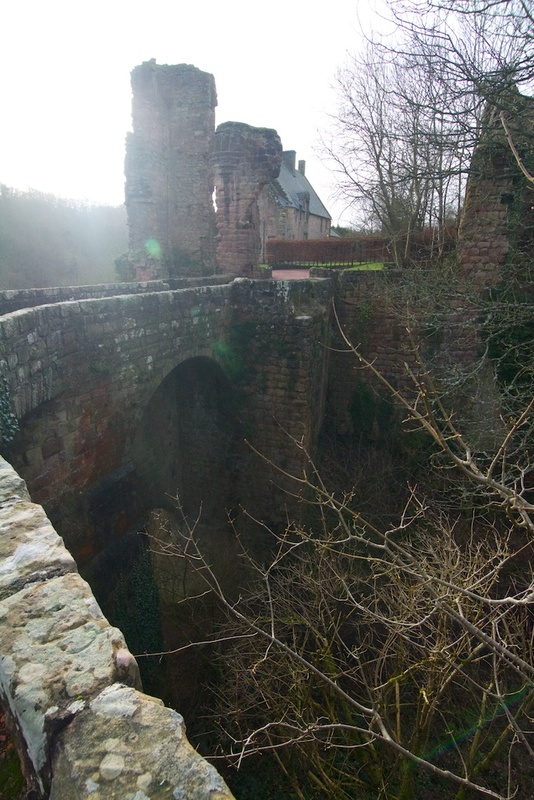 Less than half a mile to the south of the chapel, it sits on a steep-sided spur of rock within a loop of the River North Esk*, commanding a supreme position of defence; a deep chasm cuts across its only landward approach, and over this vertiginous ravine was once thrown a drawbridge. Not for the faint-hearted, although no one could accuse any of its early occupants of excessive nervousness. * This is the North Esk in Midlothian, not the one in Angus. Descended from Rollo, 1st Duke of Normandy, the St Clairs came to Scotland after the Norman conquest, where one William St Clair became a favourite of Malcolm Canmore. Nicknamed ‘William the Seemly’ for his proper and responsible behaviour, William was appointed cup-bearer to Malcolm’s wife, Margaret – a duty which had more significance than its title suggests, particularly in view of Margaret’s saintly virtues. Malcolm bestowed the lands of Rosslyn on William in life-rent, and when William was killed in battle against the armies of William the Conqueror, his son’s hold on Rosslyn was elevated to ‘free heritage’ . 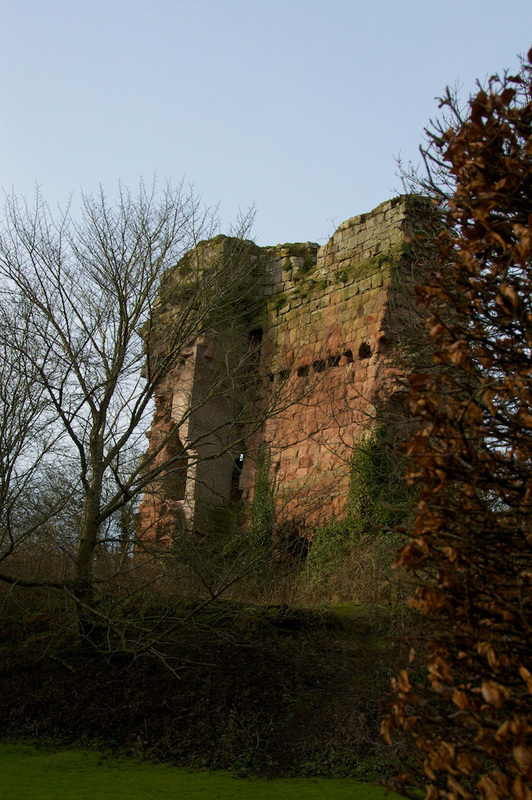 Several Williams and Henrys later, around 1304, the first stone-built castle at Rosslyn began to rise above the woodland in the glen. It must have looked forbidding when viewed from the base of the five-storey ‘lantern tower’, but surprisingly it was not invincible: it was ravaged by an accidental fire in 1447, and almost 100 years later it was in flames again, thanks to English forces under the Earl of Hertford; they had been despatched to Scotland by Henry VIII to carry out his plan of ‘Rough Wooing‘, a campaign of fire and sword through which he hoped to obtain the hand of Mary Queen of Scots for his young son, Edward. A soothsayer might have seen a pattern in the history of Rosslyn, because it was another century before war returned to its gates: in 1651, the big guns of Oliver Cromwell were rolled into position on high ground to the north. 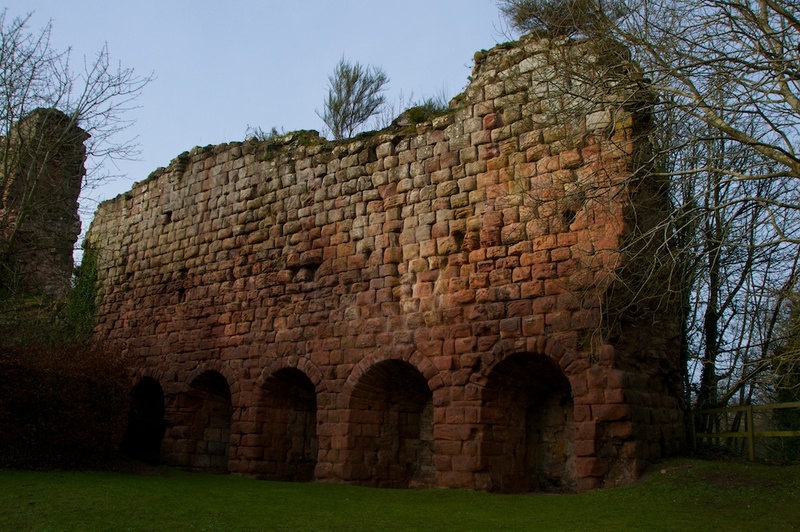 When General Monck gave the signal to fire, the ancient walls of Rosslyn exploded under the shock of cannon, crumbling and toppling into the courtyard and into the river below. The noise alone must have been terrifying. And Monck made sure of his work: the fragments that remain tell a story of brutal destruction, their edges still sharp and raw. Surprisingly, some of Rosslyn’s heritage survived. Within the courtyard, and built onto the original five-storey tower, is a mellow sandstone house that might not look out of place in Edinburgh’s Old Town. This was put up in 1597 by William Sinclair – one of the many to bear that name – and it is still in use. Since Rosslyn Castle is privately owned, it is not possible to see inside the house unless you’re staying as a guest (it’s available for short lets and holiday rentals). However, from various descriptions on the website of the Landmark Trust and others, it seems well worth exploring. William Sinclair’s original ‘great hall’ is now occupied by the kitchen and panelled dining room, and below the ground floor of the ‘modern’ house are the three remaining storeys of the original tower, accessed by the ‘great turnpike’ or staircase from the entrance hall. Here is the original kitchen, with a fireplace big enough to roast an ox, and several more rooms, with cellars beneath. Part of the forework still stands to quite a considerable height, pierced on the inside by a row of interesting arched alcoves which I can’t seem to find a purpose for. They look to have been a structural element of the turrets, as shown in the small drawings on the St Clair genealogy website. 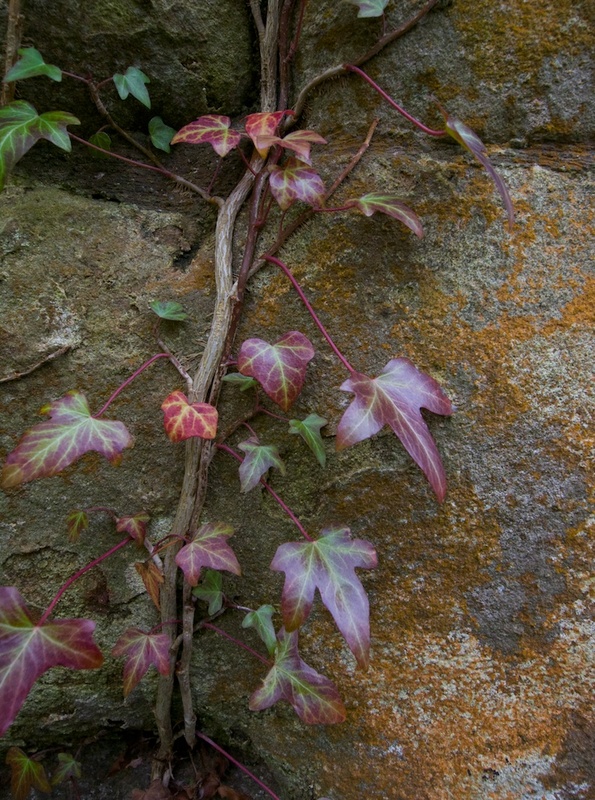 On the outside, trees are pressing like a whispering army and ivy is assailing the stonework with loving stealth. It’s almost impossible to view the castle from this side, because the ground drops right away. With the low sun already filtering through the branches on a cold January afternoon, Rosslyn Castle seemed withdrawn into itself, like a wounded knight with his sword drawn in final defence. It feels like a place from which all the spirits have been driven, and now it craves the comfort of silence to brood over their memories; but as the shadows of dusk fall, perhaps they return. From the car park for Rosslyn Chapel, a lane leads down past some spectacular old trees into the shadow of the glen. A bridge has been built over the ravine in more recent times, so you don’t have to face a drawbridge, although the approach is still dramatic. It’s also possible to descend right to the valley floor and view the castle from below (which we didn’t do). 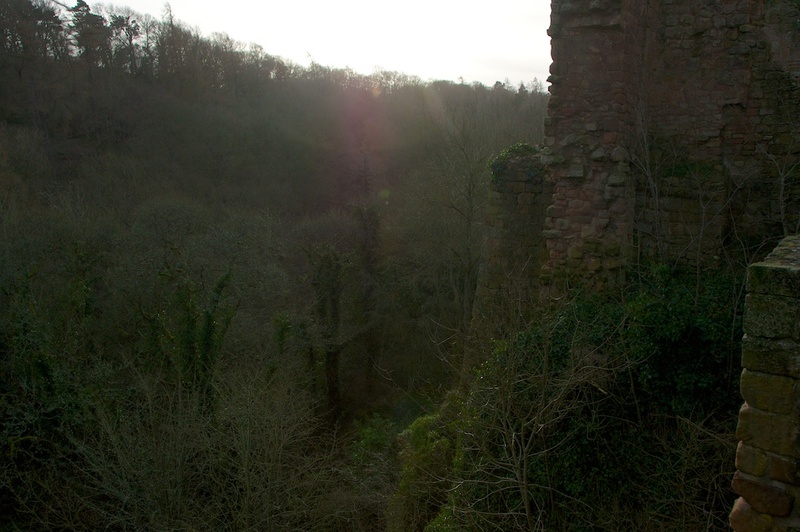 The ruins are in the care of the Earl and Countess of Rosslyn; there’s no admission fee to look around them, but it is not possible to gain access to the house unless you’re staying there. For more details about this, visit the Landmark Trust website. I didn’t know this existed, despite having visited Roslin more than once. The phantom dog sounds quite scary, I wouldn’t fancy mooching around there after dark. I think I only knew of it from hearsay, Lorna. Certainly not many visitors to the chapel seemed to be going down the path to look at the castle. Haha, yes, that’s a delicious story about the phantom dog! I didn’t find the place particularly menacing, just quiet and rather sad. Would be interesting to hear the impressions of people who have stayed there. I know, Pat, and it’s the setting that makes it so very atmospheric. You do feel as if you’re in a little island in time. Haha, I like your thinking about the dog! You could be right. It was probably traumatised! Joanne Woolf takes us on the spooky tour of Rosslyn Castle. So many of these fascinating places to visit,so little time.I must retire forthwith. I know the feeling, Lawrence! Scotland has a never-ending supply of castles and ancient sites. I’ve never felt so much like I’m walking on history as I do here. Haha, I loved them too! I’m not sure about staying there although the rooms do look beautiful, and just imagine the views!